with our new web site, local retailers are enrolling in the CORBA member discount program. Present your current card to participating dealers for discounts. CORBA members receive $5 off registration for the Fat Tire Fest. For more info see below. Fat Tire Fest 2007 - Pre-register and receive 10 free raffle tickets! This year promises to be bigger and better than ever with more vendors, demos, prizes exhibitors and events. This year we've added a Hill Climb time trial and a wheelie contest, as well as a beer garden brought to you by New Belgium Brewing Co (Fat Tire Amber Ale). We'll have the Poker Ride and guided rides for experts and beginners, and great food. Check it out! Join us on 9/29-9/30 for Trail Maintenance on the Ken Burton Trail in the Angeles National Forest. We will be brushing the bottom 1/2 mile of trail and reconstructing the last two switchbacks. You can come out for the day or join us for the weekend. 9/29 There is also a Trail Crew work day in Palos Verdes. 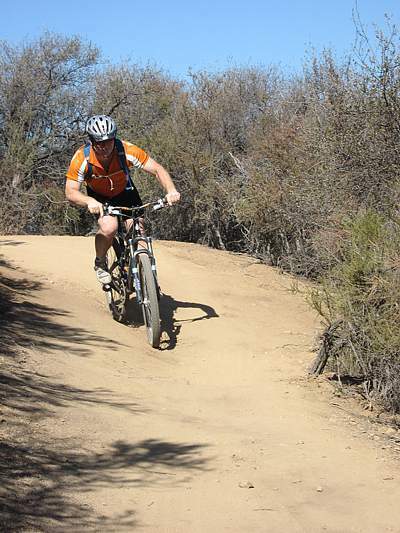 10/13 Join the CORBA Trail crew and other volunteer groups for COSCA Trail Days in Thousand Oaks. For more information on these events see the calendar. Join us with your kids or your friend's kids on October 6 for an easy ride at Malibu Creek State Park followed by a barbecue. For more information see the calendar.